Yanni’s curiosity led her to investigate the architectural history of the college dormitory, which in some ways mirrors the history of higher education itself. Her new book, Living on Campus: An Architectural History of the American Dormitory (Univ. of Minnesota Press), details the history of undergraduate college dormitories, from the first purposefully built lodgings in colonial America to dorm takeovers during the student protests of 1968. As Yanni writes, “Residence halls are not mute containers for the temporary storage of youthful bodies and emergent minds”; they reveal and “constitute historical evidence of the educational ideals of the people who built them.” At a time when college marketing departments try to attract students by highlighting luxurious dorms as much as small class sizes or winning sports teams, it can be instructive to look back on this staple of the American undergraduate experience. The first US colleges were sponsored by Protestant denominations and tended to be isolated, in rural locations or small towns, to distance students from the corrupting influence of the city. 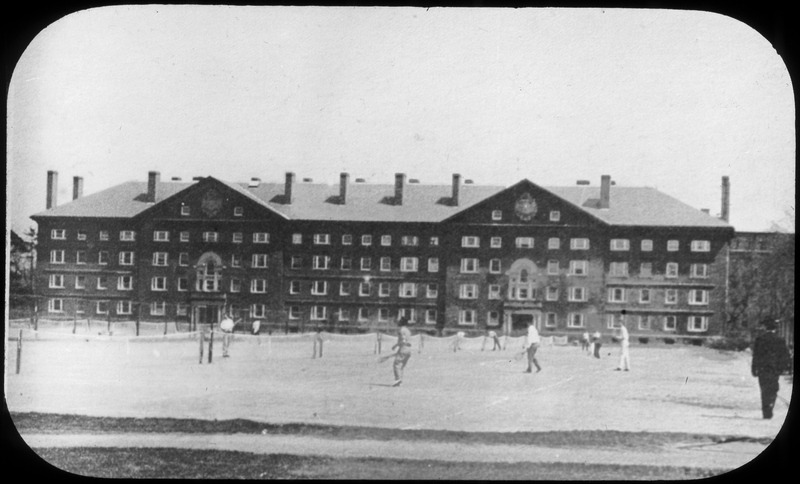 Isolation, Yanni says, allowed an institution to “imprint its specific morality upon its followers.” Dormitories were necessary when local rooming houses lacked enough berths for students, but they also fit with the missionary spirit of these early institutions. Administrators emphasized the need for a moral education as well as an academic one, so the undergraduate experience took on a semi-monastic aura. Harvard University was at first a single, multipurpose building, with classrooms right next to sleeping rooms, on the outskirts of the newly founded town of Boston. As Yanni discovered, Harvard’s first governing board thought this provided “an advantage to Learning” because “the multitude of persons cohabiting for scholasticall communion” away from the rest of the world would serve to create America’s first crop of Puritan ministers. Harvard University was at first a single, multipurpose building, with classrooms right next to sleeping rooms. But that’s not to say that students agreed with the earliest stated purposes of dormitories. Benjamin Franklin, for example, was less interested in the moral or pedagogical benefits of his collegiate years than in socializing with other members of his class in order to find friends, business partners, and future brothers-in-law. In the absence of dormitories and sufficient rooms in private houses, students often took it upon themselves to create their own communal spaces: the first “purpose-built” fraternity houses. The first, the Zeta Psi house at the University of California, Berkeley, was merely a structure funded by alumni in the 1870s. As fraternities grew along with colleges, Yanni writes, each alumni group wanted “its younger brothers to occupy a house that was an ‘architectural ornament’—a sign of the fraternity’s wealth and a demonstration of the brothers’ contribution to the college.” This gave rise to the fraternity mansion, a design exemplified by the late 19th-century Psi Upsilon House at the University of Michigan. This new emphasis on wealth meant that fraternities were often expensive and exclusive. But exclusivity was, in many ways, already built into the American collegiate experience. 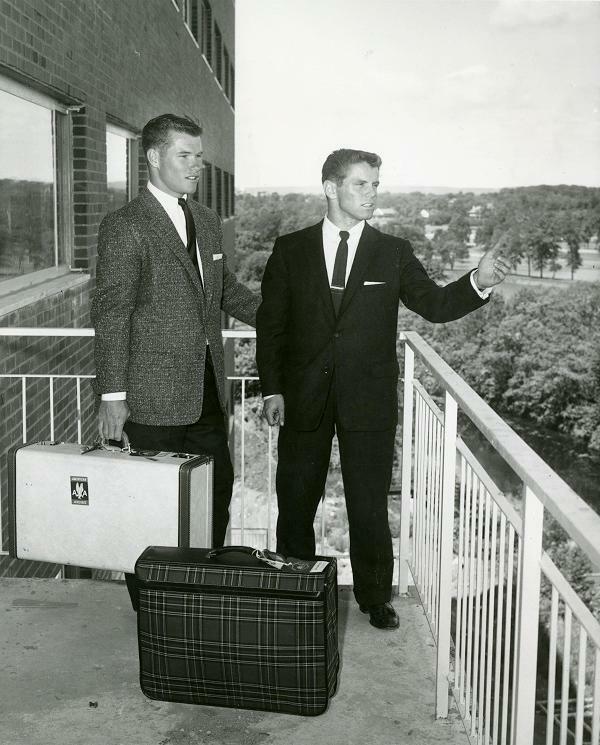 Dorms initially were almost always segregated. “College life introduced men to other men like themselves,” Yanni writes. But when men who weren’t members of the white Protestant elite became students, most institutions shunted them into separate housing. The Harvard Indian College , for example, was built in 1655 so that white students wouldn’t have to live with Native students. This trend continued when white women of the middle and upper classes began to earn undergraduate degrees, in the mid-19th century, at both private women’s colleges and large land-grant universities. These students were expected to become homemakers, wives, and mothers, so their dormitories reflected the ideology of domesticity: they were not boarding houses but “cottages” to fit them for the roles they were expected to fulfill. This reflected a common educational philosophy of the time: as Charles F. Thwing, president of Western Reserve University in Cleveland, said in 1895, “all that learning and culture can offer” to women is “for the betterment of the home,” and to create fit helpmeets for male undergraduates. Yanni says that she was surprised to discover that this idea had influenced the plans for buildings constructed as late as the 1910s. When she was doing archival research about the University of Michigan’s Martha Cook Building , she discovered that “the donor wanted the women’s dormitory to civilize the young men.” He thought that young women’s university experience should be like a “charm school,” says Yanni, and the architecture of the dorms “perfectly aligns” with that goal. The multitude of lavishly decorated reception rooms and the large dining hall taking up the first floor of the dormitory suggest that once women came down from their rooms, they were to focus on socializing, rather than studying. Yanni ran into difficulties when researching what the expansion of American higher education to people of color meant for college residential living. “It’s very easy to find out who the first African American graduate of a university was,” she says, “but it’s many days in the archives if you [want to] find out if that person was allowed to live on campus.” Some of the earliest archival traces on the subject come from white students, alumni, faculty, and administrators objecting to having students of color living in residential facilities. Yanni points to the work of education historian Cally L. Waite on Oberlin College, which was founded in 1833 and admitted black students beginning two years later. By looking at community and student newspapers from the 19th century, Waite showed that African American and white students were living together in Oberlin dorms: in the 1880s, a long controversy erupted when a white matron, at the behest of white students, pushed their black classmates to a separate table at Ladies Hall , a women’s dorm. Throughout Living on Campus , Yanni engages with the concept of “environmental determinism”—a Victorian, quasi-utopian idea that environment shapes personal character, and that purposefully built, orderly buildings are essential to molding, in this case, undergraduate students into ideal citizens. By the 1920s and ’30s, dormitories had become crucibles in which deans and other university administrators, acting in loco parentis, transfigured children into adults. Administrators, writes Yanni, came to see dormitories as “an integral part of the educational pathway.” All students would, ideally, live on campus to get the full benefit of the collegiate experience. “Students rejected in loco parentis,” writes Yanni. “They did not need caretaking. They were adults who wanted to be treated as such.” This radicalism manifested itself in the students’ living arrangements: integrated dormitories and projects like Kresge College at the University of California, Santa Cruz, which tried to imitate the “urbanism of an Italian hill town.” The residential area, built around the site’s redwoods, included not just dormitories but cafés, launderettes, meeting spaces, and classrooms in what were termed “living-learning units.” Some of these units had no interior walls at all, as residents themselves were supposed to divide up the space based on communal agreement. Despite these radical building plans of the 1960s, Yanni observes, the dorms of today still mimic many of the same core features of dorms of the past. Today’s students come from increasingly diverse ethnic and socio-economic backgrounds, but like their early forebears, they often share rooms along long corridors, in buildings that house many of their fellow students. The college dorm still acts as a space to transition into adulthood. This offers an explanation for a recent trend in student affairs: the construction and promotion of what Yanni terms “ever more elaborate residence halls, some of which resemble five-star hotels,” in an “amenities arms race.” Americans have come to accept dormitories as an essential and integral part of the undergraduate experience, one that should help students achieve academic excellence and fulfill their demands for apartment-like and therefore independent adult living, while also providing opportunities for meaningful interaction. “Dormitories are a measure of the fact that Americans value higher education for networking as much as for higher education,” says Yanni. Like all buildings, she adds, college residences also “carry the weight of social values, because unlike writing a poem or even painting a painting, it requires an enormous amount of capital to build a building.” Or, to put it another way, dormitories “don’t just happen.” Remember that on your next stroll across campus. Elyse Martin is associate editor, web content and social media, at the American Historical Association. This article was originally published at the American Historical Association's Perspectives on History.